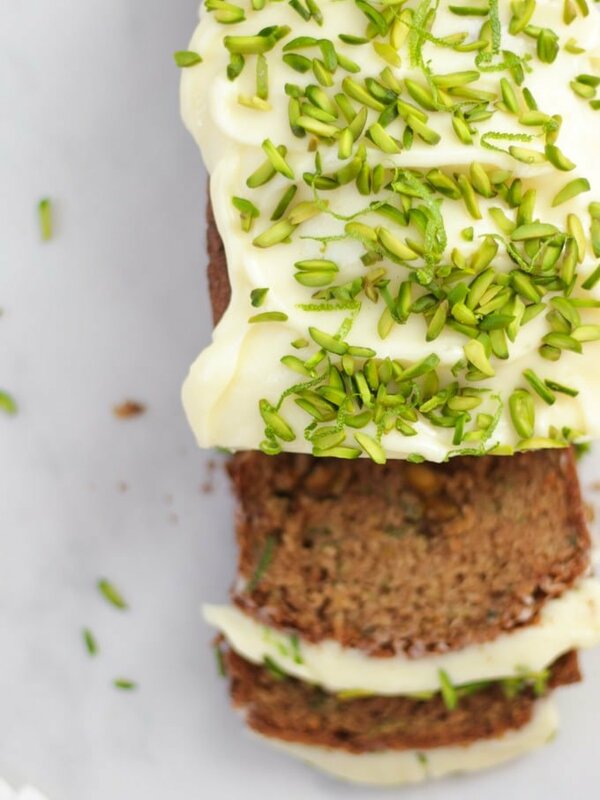 This delicious Courgette Cake recipe is so easy to make, packed with lime and topped with delicious mascarpone cream cheese frosting icing. The perfect summer bake to use your vegetables in! Also easily made Gluten Free. Have you ever grown courgettes yourself? If you haven’t grown them before and you fancy yourself as a gardener, courgettes are 100% the summer thing to grow. As I mentioned in my Courgette Fritters recipe a few weeks ago, they are SO satisfying. They just grow and grow without too much TLC. Making me feel like next year I’ll be exhibiting at the Chelsea Flower Show or similar. If that’s not reason enough to grow some. Two more words. 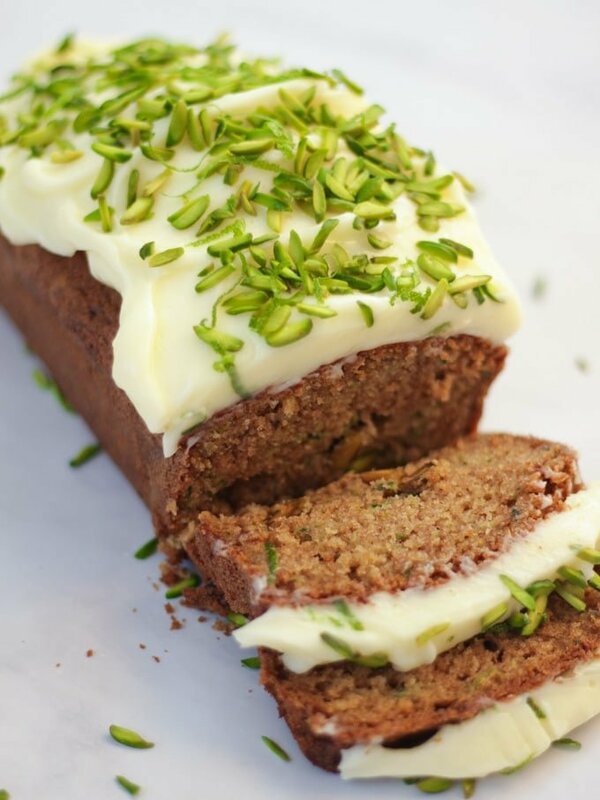 Courgette Cake. It’s SO GOOD. A delicious texture, a portion of veg and to me, one of the tastes of summer. 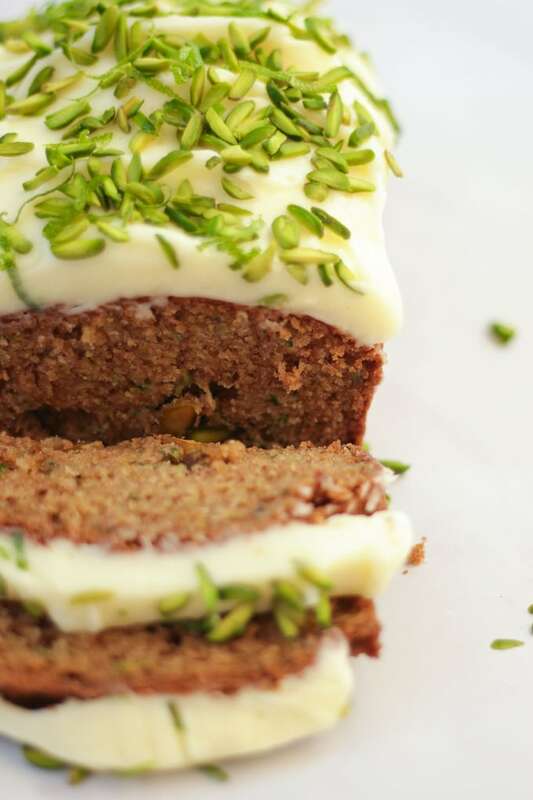 Even if you’re not a gardener, please buy some courgettes and try this Courgette Cake recipe! 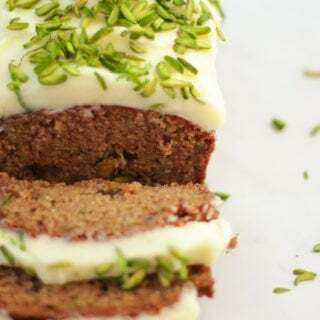 How do you make Courgette Cake? This cake is super simple to make in one bowl. Mix your sugar, oil and eggs until well combined. Then you need to grate your courgettes and squeeze out as much moisture as possible. This is really important to help the cake not be soggy. Just use clean hands and do it over the sink. Then add in your grated courgettes, pistachio nuts (not necessary but they add a lovely bite), lime zest, self raising flour, bicarbonate of soda and cinnamon. Stir until totally combined. Pop it all into a loaf tin, lined with baking paper and bake until firm and cooked through. Meanwhile make your mascarpone icing whilst the cake is in the oven and store it in the fridge until the cake is cooked and totally cold. Slather it on and enjoy a bit wedge of cake in the sunshine! Be sure to use a coarse side of the grater for grating your courgettes, they will be too mushy if you use a very fine grater. IMPORTANT TIP! After grating your courgettes for the courgette cake, with clean hands, squeeze out as much liquid as possibly. You can do this in a sieve, but a good squish in your hands will do the best job. This is really important so that the cake isn’t too wet. When you make your cream cheese frosting, mix very softly and slowly to avoid the icing getting too runny. If it does go a little runny, pop into the fridge for an hour to firm up. 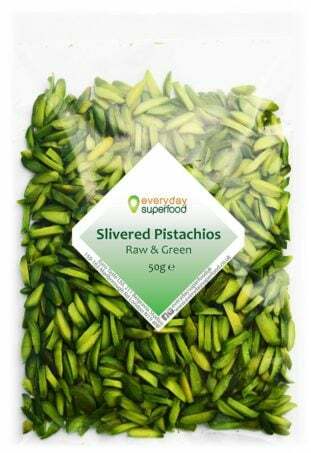 Pretty Pistachios – I LOVE these pistachio nut slivers, I’ve only found them on Amazon but I think that they really finish this cake beautifully. You’ll only use some of a pack to decorate this cake, but they keep well in the fridge. 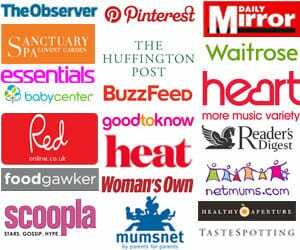 Fancy some other easy cake recipes? How about my Chocolate Orange Cake Recipe or my Nutella Cake Recipe? Hope you enjoy this recipe as much as we do. 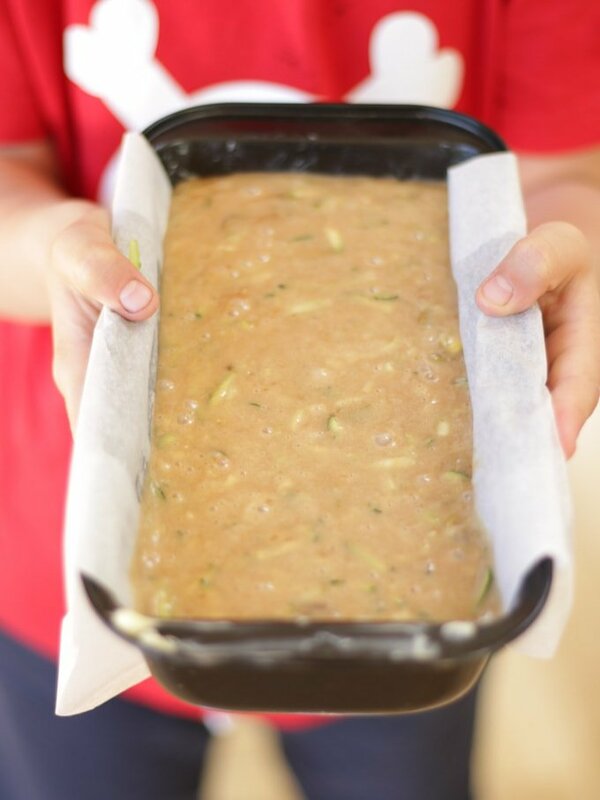 I’d love to know how you got on and what you thought of it if you make this Courgette Cake recipe. Please rate the recipe and leave me a comment below if you do. 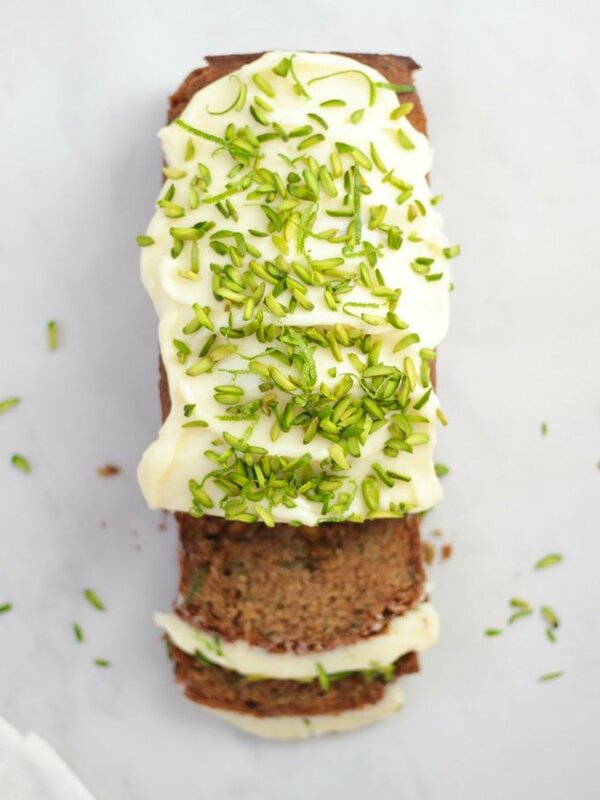 This delicious Courgette Cake recipe is so easy to make, with lime and delicious mascarpone cream cheese frosting icing. The perfect summer bake! Mix the sugar, oil and eggs until well beaten. 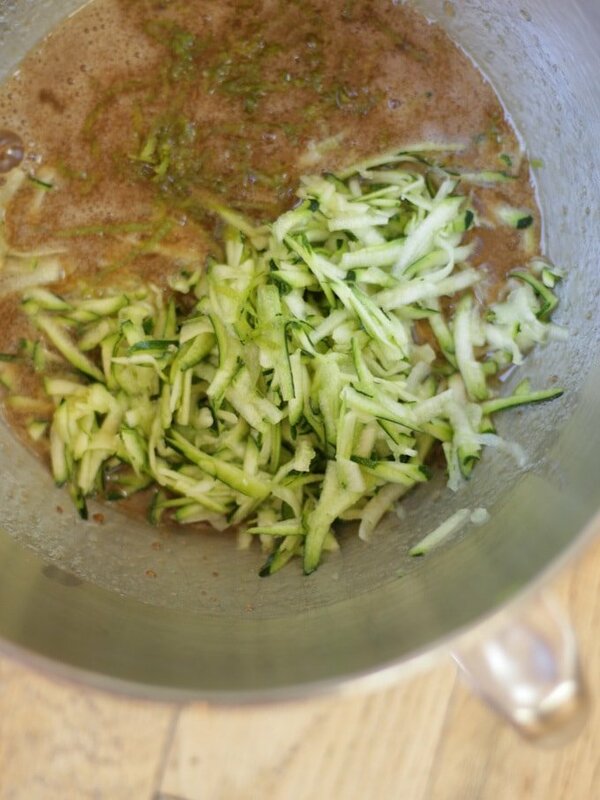 Stir in the grated courgettes (after you've squeezed out the liquid - see recipe tips!). Stir in the nuts (if using), lime zest, self raising flour, bicarbonate of soda and cinnamon. Stir until totally combined. Pour into a lined and greased loaf tin and bake for 45 - 60 minutes until cooked through and a skewer comes out clean. Meanwhile make the icing by very gently combining the mascarpone with sieved icing sugar and lime zest. Pop into the fridge until the cake is totally cold. 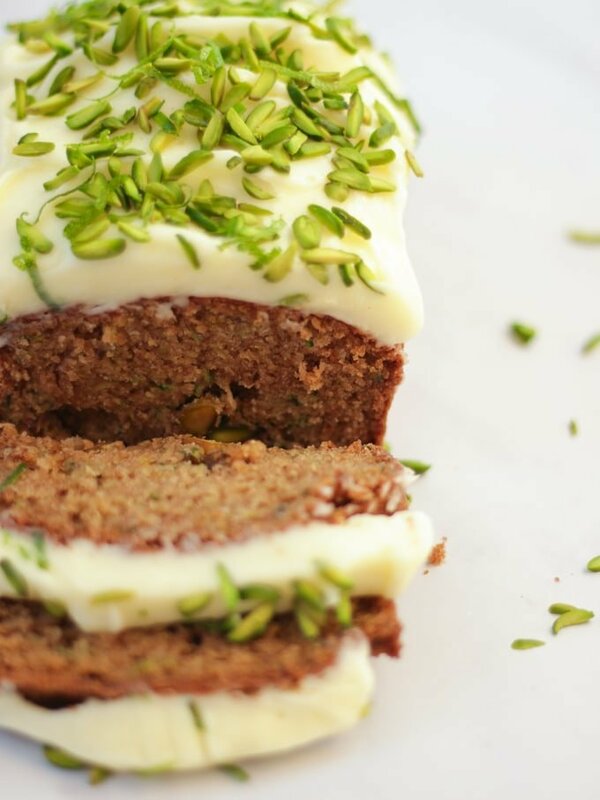 Smooth the icing over the top of the cake and sprinkle on the pistachios and lime zest.